He said Nigerians must be resolved to change the direction of the country. 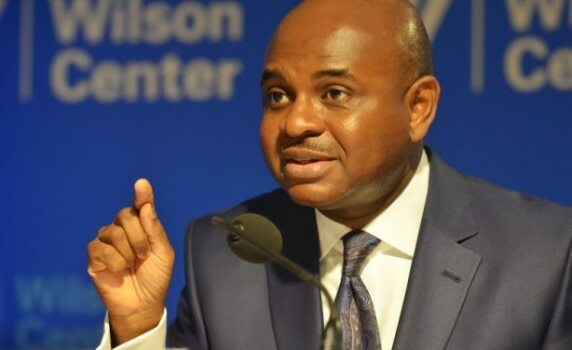 Aspirant for the 2019 presidential election, Prof. Kingsley Moghalu » , has told Nigeria’s so-called ‘failed and recycled politicians’ that Nigerians are ready to vote them out of power. While speaking at TEDx Maitama, Abuja on Saturday, July 14, 2018, the former deputy governor of the Central Bank of Nigeria (CBN) urged Nigerians to not relent in their drive to change the nation’s destiny and force through a regime of good and accountable governance. He blamed the political elite for lacking the political will to rid the country of insecurity, corruption and poverty that are holding the country back from achieving its true potential. 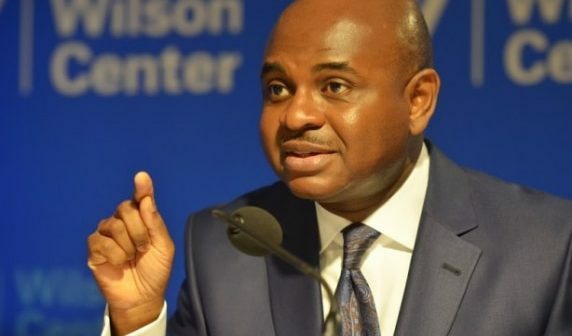 Moghalu noted that there are no magic wands to effect change, and that Nigerians have to resolve to change the direction of the country which he said is plagued by increasing despair. He said Nigerians hold all the power to punish the ruling elite for their incompetence and write a new chapter in the country’s history. He further urged Nigeria’s young generation to not make the mistake of staying away from politics, and to not only restrict themselves to merely complaining on social media. He said the battle to change the country will take a huge amount of painstaking work. Exactly 20 years ago, Nigeria had an opportunity. The end of military rule was in sight with the death of Sani Abacha, and the time was ripe to fundamentally remake the character of the Nigerian state. Some of those who had fought military rule positioned themselves to take advantage of that opportunity by getting involved in party politics at all levels. But many were ill-equipped to manage Nigeria and her vast resources. Many others, some of whom were this country’s best and brightest, also stayed away, for a variety of reasons including fear for personal and family safety. Others preferred to watch from afar. The Nigeria we have today is a direct descendent of that chaotic period in our history. Back then, I was in my early thirties, making my way in the UN system and contributing to the rebuilding of nations torn apart by war: Rwanda. Cambodia. Former Yugoslavia. I was optimistic for Nigeria’s future after Abacha passed and hoped things would work out. They did not. The optimism that led many to return around 10 years ago, me inclusive, has been replaced with increasing despair. So much so that we are seeing more and more young Nigerians leave for elsewhere through legal and not so legal means. You may know someone who has already done this, or is planning to; risking life and limb in the process, or being sold as slaves. Who can blame them? There is little to convince anyone that Nigeria values life. If it is not communal clashes, it is tankers and trailers. If it is not malaria, it is cholera, or some other disease long forgotten in much of the world. If it is not armed robbers, it is SARS. It is sometimes difficult to tell the difference between the two. Another cause for despair was the widespread vote buying that characterised the recent Ekiti elections. People sold their votes for N5,000 or less, and this money no doubt came from our public funds. What else could it have been used for? If elections are decided by money to that extent, then it means the thieves win more often than not. It also means that once in office, that ‘investment’ must be paid back somehow. Who pays for it? All of us. We will pay in that hospital not refurbished, those doctors and teachers not paid, those roads not fixed. However, I still have hope for this country. I still believe that a genuine improvement in the quality of life for the majority is possible, because I have seen it happen with my own eyes elsewhere. Shattered countries like Rwanda stood shakily to their feet and moved forward after the terrors of genocide. Colombia survived 50 years of an insurgency, while simultaneously combating drug related violence in its major cities. There is no challenge that Nigeria is facing now that other nations have not surmounted. The first step is to believe it is possible, to believe that Naija is still worth fighting for. The best time to change this country was 20 years ago. The next best time is now. There are many, many things in our country that need changing, but these changes will not come overnight. They are the result of painstaking work to bring people together, educating them and making them see the gravity of the issues at stake. The civil rights movement in the US to the anti-apartheid movement in South Africa and many others in between, are the result of hard work done behind the scenes. The mentality that Bring Back Our Girls and Not Too Young To Run brought to bear on their activism is important. They did not restrict themselves to merely complaining on social media, they organized and lobbied. They didn’t just sit on their hands, hoping the authorities would act. They went out and forced their hand. Power gives up nothing without demand, that is why for as long as all we do is complain on social media about our leaders, nothing will change. We must demand better. We must demand that Nigerians stop dying needlessly without consequence. We must demand that our government create opportunities for Nigerians to achieve their potential. We must demand an end to the corruption that has retarded our efforts for decades. These demands can only be met through the ballot box, by electing people with a vision for our country, instead of those who are part of the problem, no matter what name they bear this time around. But we cannot make these choices without being able to vote. How many of us have their PVCs? Do you know that the last date for registration for the elections is August 17th, just over a month from now? There is no one today who can argue that our government protects the weak from the strong. If anything, the strong are given the freedom to attack the weak, safe in the knowledge that nothing will happen. Hundreds die but it takes days to get a response from the government. Grievous allegations are made, but mum’s the word. Mahatma Gandhi said once that the measure of a society is not in how it treats its strongest, but how it treats its most vulnerable members, those some might call ‘nobodies’. Government is there precisely to protect the weak from the strong. However, you and I are the only ones who can change this. No one is coming to save us. There are no messiahs or magic wands. Only you and I can make the case daily that things do not have to continue in this direction, that there are alternatives to our current situation and those who led us here. There is a reason why otherwise well-meaning and accomplished technocrats go into government and leave with their reputations damaged more often than not. It is not that they do not know what needs to be done. They do. The problem is that very often, the priorities of the political leaders are very different from theirs, and politics wins every single time. Politics in Nigeria is bigger than any policy. That is why for any reform to take hold, political will is the be-all and end-all. It does not matter how good the idea is, it doesn’t matter how many lives it can enhance. It is in our power to change our destiny. It is within our power to write a new chapter in our history. Many are leaving Nigeria because they feel things are hopeless. They read the news and look at their own surroundings and are driven to despair. We must not give in to the cynicism which says that Nigeria is “finished”. It will only be finished if we do not speak up. Four years ago, a sitting President in Nigeria was voted out of office for the first time. It was unprecedented, because of the power of incumbency and the vast access to resources it confers on the holder of that office. But it happened anyway because enough of us chose not to reward failure. Many thought it would be the start of better governance, but have come away feeling disappointed. However, we have not yet reached our goal, and so we must not give in to despair. We must draw inspiration from the various countries and social movements within those countries that have taken years to succeed. Our own journey has just begun. If we pull back now, if we give up and go home, we will only surrender to those who think Nigeria is for themselves and their children. Therefore I say: no retreat, no surrender. There are many who will make the argument that we have to enter into coalitions with other parties to push the current administration out of office. I say no, and that is because these coalitions have many of the same people who have actively destroyed this country. They are only aggrieved only because they are not “chopping” right now. Only a clean break from the people and thinking of the past will produce a different outcome. Rearranging the deck chairs on the Titanic is not good enough. There will also be those who say that it is not yet time for such talk. They will say that Nigerians are not yet ready for a nationwide issue-based campaign that rejects money politics. They will say that Nigerians only understand appeals to religion and ethnicity, as well as stomach infrastructure. Once again, I disagree. About two weeks ago, French President Emmanuel Macron visited Nigeria, and one of the things he recalled was how some people told him to ‘wait a little bit’ before pursuing his presidential ambition. He built a party – La Republique en Marché – from nothing to winning a huge majority in the French parliamentary elections in just one year, because they were offered a sharp difference from the existing political establishment in France. He did not wait for his time, and the rest is history. And so I say today: It is time. I also say to Nigeria’s failed and recycled politicians: Time’s up. Moghalu announced on May 24, 2018 that he’ll be contesting for the presidency on the platform of Young Progressive Party (YPP) » . In his statement titled, ” A bold dare, a bold response to Nigeria’s call, and a bold invitation: Have the courage to join us” , he disclosed that the urge to not become a part of the old order of failed and recycled politicians influenced his decision to join YPP, noting that he wanted to join a party that shared his vision of leadership as one of service and accountability. Independent National Electoral Commission (INEC) in June 2017.